With a clever anti-theft design boasting a plethora of features, Urbanvibe is the elegant unisex backpack you didn’t know you needed. NXTPACK unveils Urbanvibe, the world's first anti-theft travel backpack with magnet assisted FidLock® Camera Mounting System built-in. Recently launched on Kickstarter and IndieGoGo, the first 500 “backers” get the Urbanvibe at 55 percent off, through Nov. 19. When the people at WenPod, a company known for their state-of-the-art digital camera stabilizers, realized that many of their customers sought more elegant and efficient solutions for traveling with their photography equipment, they were inspired to start NXTPACK, a new company dedicated to engineering the world’s best backpacks. This process culminated in the creation of their first product, aptly named “Urbanvibe,” a backpack with advanced anti-theft, organizational and accessibility features, in addition to the built-in camera mount. Having just launched just last week on Kickstarter and Indiegogo, the backpack has been named as a “Staff Pick” by Kickstarter. As the world’s first backpack to integrate a built-in camera mount, the magnet-assisted FidLock® Camera Mounting System allows the wearer to attach any size camera to the shoulder so as not to miss out on a photo opportunity. Although companies like Peak Design sell attachable mount clips, they can cost as much as $70 and up. But despite the integration of this feature, the Urbanvibe still compares favorably in price to similar travel, camera and anti-theft backpack brands such as Pac Safe, Peak and Lowerpro. But this is just the tip of the iceberg. Incorporating a whole host of advanced features from a built-in USB power bank, to a telescopic cable lock to hidden RFID pocket, the Urbanvibe is positioned to become “must have” for travelers, commuters and photographers alike. Designed with the modern wearer in mind, the advanced functionality of the Urbanvibe does not sacrifice form – far from it. Clean lines and sophisticated unisex design create a sleek and stylish travel accessory for both men and women alike. There’s just one caveat. This game-changing new product has been launched as a crowdfunding project, and will only be produced if it reaches its goal by Sun, Nov. 19. 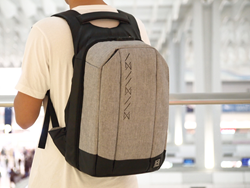 To reward its enthusiastic fans, NXTPACK is offering an “Early Bird Special” to its first 500 backers on both Kickstarter and IndieGoGo: 55 percent off the first Urbanvibe backpack produced. If funding goals are met, the first backpacks are slated to ship in January 2018, for an MSRP of $218. To learn more or donate please visit nxtpack.com.